Around 6,000 Palestinians have been shot by Israeli forces during often violent demonstrations along the Gaza border since March, according to the health ministry in the strip. 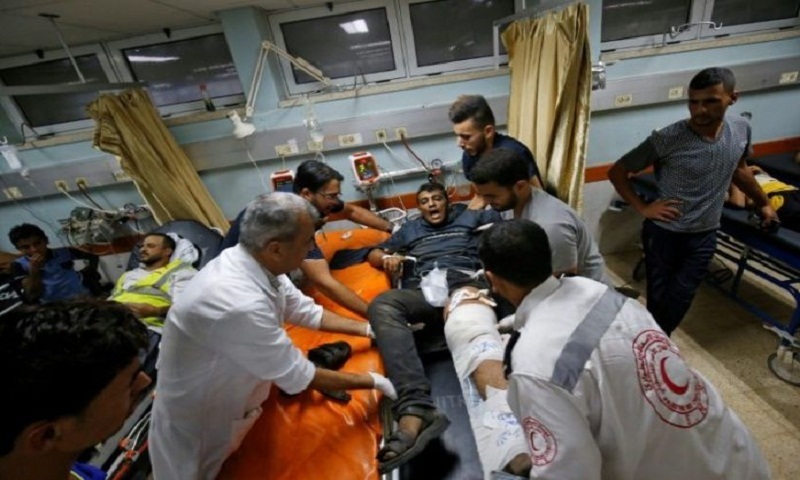 MSF (Medecins Sans Frontieres), which has provided care for thousands of Palestinians since the protests began, said the healthcare systems in Gaza were being overwhelmed by the number of cases and the often complicated treatments needed. Most of those hurt by live fire were shot in the legs, often resulting in open fractures prone to infection, MSF said. Around 1,000 have infections that could lead ultimately to amputations or even death. “This many patients would overstretch the best healthcare systems in the world. In Gaza, it is a crushing blow,” Marie-Elisabeth Ingres, MSF’s chief for the Palestinian territories, said in a statement. Israel maintains a tight blockade of Gaza it says is necessary to isolate the strip’s rulers Hamas and keep the Islamist group from obtaining weapons or material that could be used to make them. The border protests have been backed by Hamas, with which Israel has fought three wars since 2008. Protesters are calling for Palestinian refugees to be able to return to their former homes now inside Israel. At least 235 Palestinians in Gaza have been killed since March 30, mostly by Israeli fire during border clashes but also by air and tank strikes. Two Israeli soldiers have been killed over the same period, one by a Palestinian sniper and another during a blown Israeli special forces operation within the Gaza Strip.